WRAP-COTE which is manufactured by InstaCote, Inc. uses our softer polyurea coating applied over high quality 1/16” foam backed pressure sensitive tape. 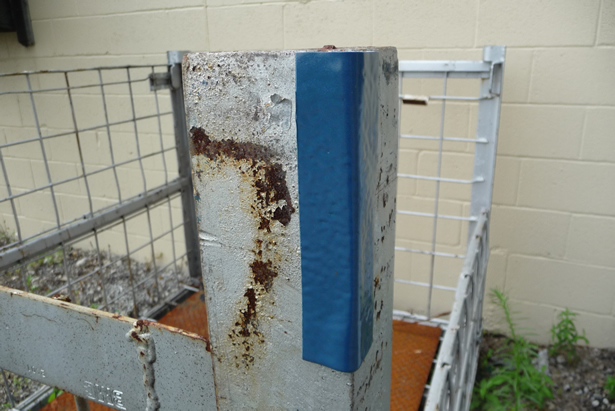 The ready to use peel and stick tape is excellent for use on shipping racks and containers. WRAP-COTE has been developed for indoor or outdoor use, easy installation, and we can offer our tape in more than one skin hardness, color, with a smooth or textured surfaces. The acrylic adhesive cross linked polyethylene backed foam transfer tape has been tested for adhesion on most metal surfaces. The 1/16” foam pad when used with our softer polyurea provides an extremely soft durable pad. For best results on metal surfaces we would suggest cleaning the surface with isopropyl alcohol prior to applying our tape. The polyurea we use is made at our Erie, MI. Plant. Our polyurea coating provides exceptional physical properties typically not seen with most dunnage materials used. Polyurea coatings are non- marring, UV stable, chemical resistant, flexible (300-800% elongation) and offer long term durability. WRAP-COTE by InstaCote standard tape offers a smooth coating at 40 mil thicknesses on 1/16” foam, 65 durometers shore hardness in black. We can provide a textured surface, greater thickness, harder durometer and additional colors. The standard coated tape size comes in a 59.5” x 48” sheet but can be cut to order.